Woo I finally went to a cool place recently! Conveniently, I already planned a trip to Seattle last weekend when I realized that Funko was opening up their new headquarters location with a flagship store just a couple weeks prior to my visit. My boyfriend and I went to check out the store and it did not disappoint! If you haven't heard of Funko, maybe you'll recognize their toys. Have you ever seen the adorable Star Wars POPs that grace the shelves of Wal-Mart, Target and pretty much every other retailer that sells Star Wars merchandise? Well, those are made by Funko! 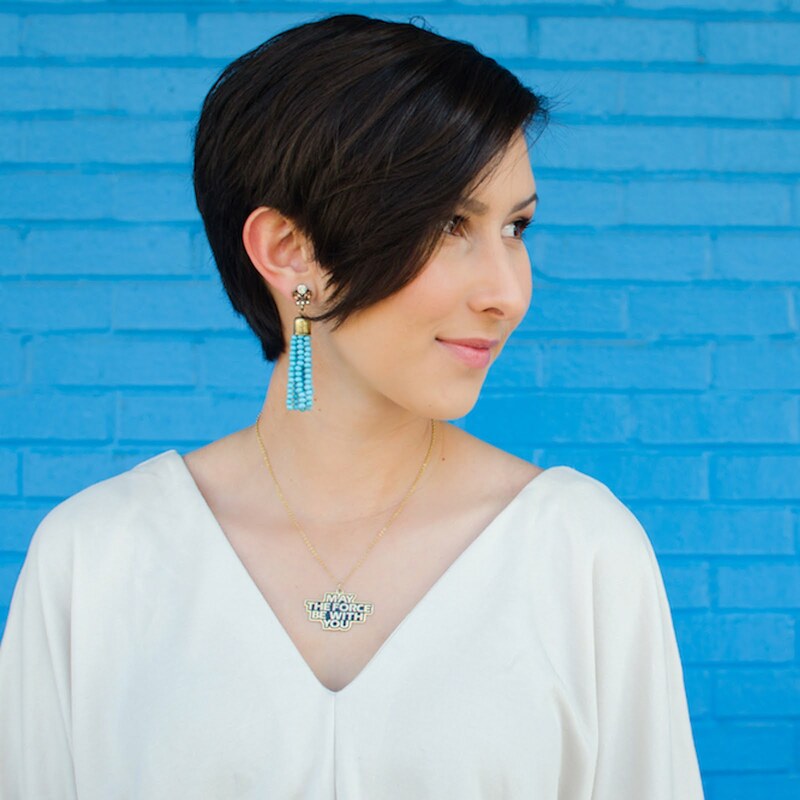 They're also known for their Rock Candy figures and the company recently acquired Loungefly- the brand that is famous for creating pop culture inspired handbags. 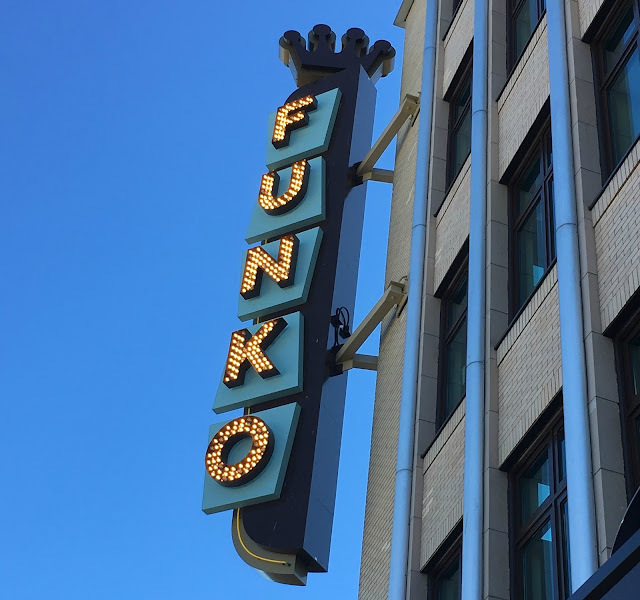 Funko HQ and their brand new flagship store is located in Everett, Washington. My boyfriend and I headed over there after grabbing lunch Saturday afternoon and were surprised to be greeted by a line that wrapped along two sides of the building. Even though it looked long, we were through the line and inside within 20 minutes. They have some pretty cool window displays that you can look at while waiting in line like these retro life size Batman figures and some HUGE Funko POPs on the top of their building! Once we were inside, it was easy to see the layout of the store. The center of the room was a checkout area with themed rooms all around it. To the left is the Harry Potter section with views from Diagon Alley. Hagrid was outside the gates to greet us and I spotted some other familiar faces inside like Dobby and he who must not be named. The Harry Potter room had all sorts of Funko toys relating to the movies and a few exclusive T-shirts for men and women. The cutest item I spotted was a Hogwarts train set that had Funko POPs of Harry, Hermione, and Ron in different train cars that could all connect together. Adorable! The next room was my absolute favorite, Star Wars! The whole area with themed to make you feel like you were on the planet Hoth. There was a huge Taun Taun Dorbz figure with Han Solo riding him. Luke Skywalker and a Wampa were tucked away in an ice cave while Darth Vader and his Snowtroopers looked down on you. I really liked how all of the merchandise in the store was organized. Funko POPs were paired with coordinating T-shirts and Loungefly bags in each room. It was a simple shopping experience- especially if you were looking for items themed after a specific character or movie. In the corner of the Star Wars room was a the "build your own Funko POP" experience that will be coming soon. I can't wait to check this out when it's open! Next was a Marvel room with everyone's favorite heroes and villains including Deadpool on a chimichanga truck, Spider-Man fighting Green Goblin, and of course Stan Lee. They really did an incredible job making the Marvel room look like you were in the heart of a city from your favorite comic book, right in the middle of the action. There was also a Disney princess castle with a drawbridge! Tiana, Elsa and Olaf, along with Belle and friends were hanging around the castle. I even spotted Gus Gus and Jaq on the balcony of a house near the castle. This area would be a dream come true for any little princess or prince that loves Disney. While the other rooms had items that were exclusive to only the flagship store, I did not see any exclusive shirts or items in the Disney area. Another one of my favorite rooms was the DC Comics inspired section. Complete with Arkham Asylum, a Batmobile you could sit in, and life-size DC Bombshell figures! In addition to Batman, Wonder Woman, and Superman merchandise, they also had a small Game of Thrones section in this room. Lastly, there was a general sci-fi and pop culture themed room that contained all sorts of properties like Five Nights at Freddy's and Rick and Morty! There was an enormous Godzilla figure tearing apart a train full of little puppies. Overall, I was very impressed with the Funko store. There were so many little details in each room that made you feel immersed in all sorts of different worlds. 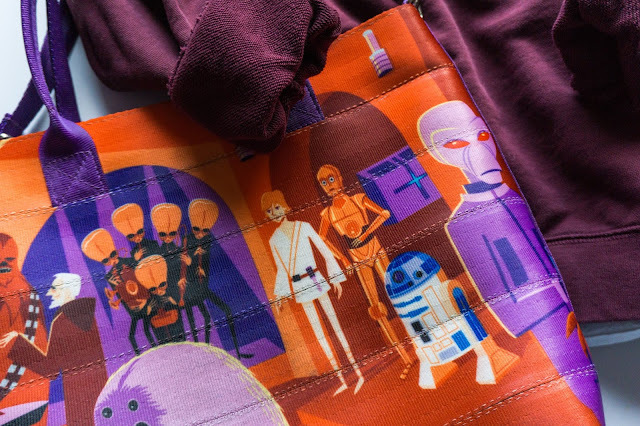 I was really happy to see so many exclusive Star Wars shirts, but I hope they add more exclusive items to the Disney section. My one gripe was that most of the merchandise didn't have price stickers on them. I had no idea how much my shirts would cost until I got to the register and noticed there were lists taped to the walls that had pricing information on them. Other than that, it was a really great experience! Definitely visit the store if you are ever near Seattle. Wow! Thanks for sharing all these great pictures and descriptions. This definitely looks like a place to put on the must-visit list. :) I admittedly don't collect the Funko Pops myself (because if I did... good-bye to all my money), but I really love their plushes and T-shirts (that Artoo mailbox tee! ), and I am definitely a big fan of life-size figures. That sounds like a fun geeky store to go to in Seattle, I definitely want to go sometime.